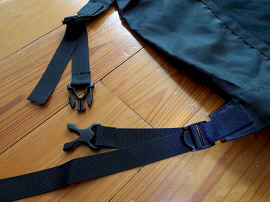 This side release buckle with a built -in safety whistle is commonly used for backpack sternum straps has been recently re-designed for better features including "full flex", anti-pinching" latching, right handed application and a larger blow hole for greater decibels This buckle has been very popular with search and rescue teams and boy and girl scouts. Same buckle as the whistleloc buckle listed above except this is a dual side release buckle so no sewing is necessary to attach webbing. Note: the new design is currently only available in the gray. The gray buckle is a little larger in size than the original design. 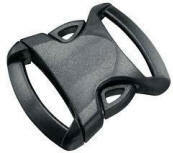 This lightweight buckle is the solution to using thin, lightweight webbing. 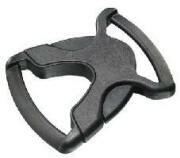 Holds webbing in place when not under tension. Works great with our lightweight nylon webbing #2029, #2030 and grosgrain ribbon. 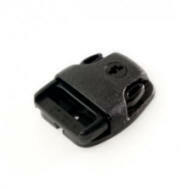 The ITW Jet Latch Cam works like a regular side release buckle but has an added locking feature to resist slippage. Once the webbing is adjusted to it's prefered tension the cam latch is pressed closed over the loose end webbing to keep the adjustment locked in place for added security. Great for waistbelts.